In a historic move that reflects a positive change in how society regards our primate cousins, the last remaining exhibitor to still force orangutans to act as stage performers in the United States has agreed to end the exploitative practice. Following pressure from various animal rights organizations, Universal Studios, with theme parks in Hollywood and Orlando, announced it will remove all primates from its live "Animal Actors" stage shows. The performances, advertised by the theme park as "Tinseltown-trained critters putting pet tricks to shame with their animal antics," features a variety of species paraded before cheering audiences. Unlike some animal shows purport be of some educational value, Animals Actors made no such claim. 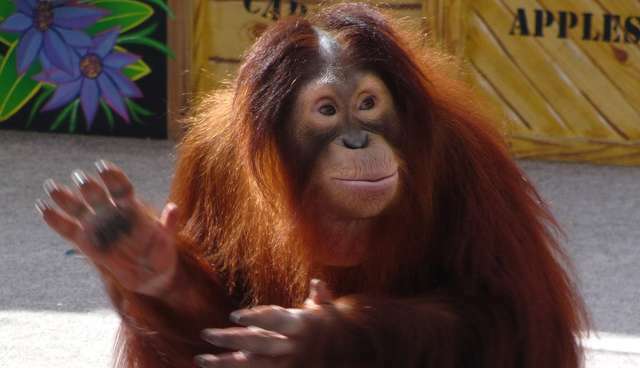 "She's definitely coming along very well with her behavior," says one presenter after ushering a timid-looking young orangutan named Ruby onstage last year. "We're going to show you some of the stuff she's been working on. Hopefully you'll be entertained by her. She's doing her best out here." But more than being just exploitative to these primates, the shows created a dangerous misperception about orangutans as a whole. Left unmentioned in the Animal Actors set above is that the primates are a critically endangered species, with some populations in the wild having declined by 80 percent from human activity. Delcianna Winders, Deputy General Counsel for PETA, hails the decision to end the such performances as a victory for animal rights. "NBCUniversal made the right call in ending the use of primates in its live shows," she says in a statement. "Savvy and kind entertainers realize that the right decision-for animals and for business-is to shun exploitation of these sensitive, intelligent animals." While primates will no longer be used in the movie studio-owned theme parks, however, orangutans and other primates continue to be exploited for entertainment in movies and on television, though that too may soon come to an end as well. Filmmakers have begun to turn to CGI to replace real animal actors, like in the upcoming film Noah which features no actual animals. Likewise, the top ten advertising firms in the U.S. have already pledged to no longer feature feature primates in commercials.